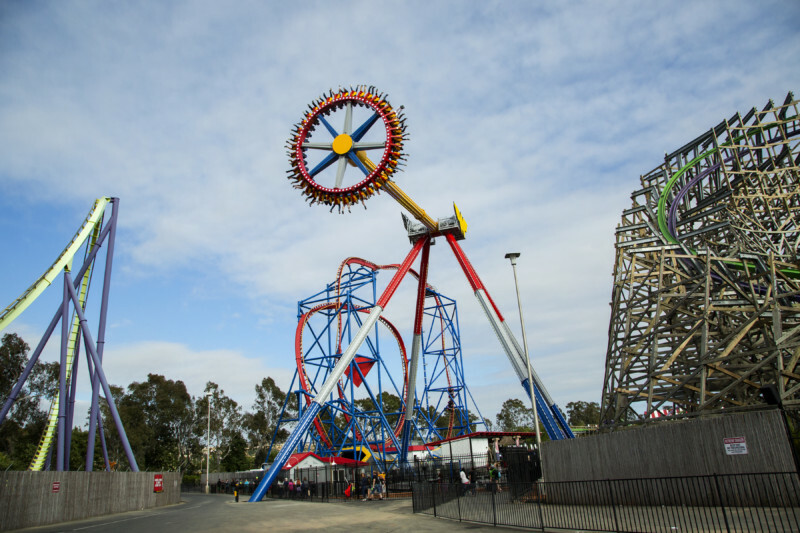 On Saturday, May 27, InPark was hosted by the two San Francisco Bay Area theme parks to sample their newest offerings – the Wonder Woman: Lasso of Truth ride at Six Flags Discovery Kingdom in Vallejo, and the Red, White & Brews Festival at California’s Great America, a Cedar Fair park, in Santa Clara. In the US, parks traditionally roll out new rides and experiences in the week leading up to and the week following Memorial Day weekend (Memorial Day was May 29). This year alone saw the opening of Pandora – The World of Avatar at Disney’s Animal Kingdom, Guardians of the Galaxy at Disney California Adventure, Ocean Explorer and Orca Encounter at SeaWorld San Diego, and Volcano Bay, Universal Orlando Resort’s third park. And this opening period is just as important for regional theme parks and waterparks as for the bigger destinations, being the start of the Summer season when many parks go from a weekend-only schedule to week-round operation. The 2017 theme park season is upon us! Over the past decade, Discovery Kingdom has created what McCoy calls “a skyline of thrilling rides” at the front of the park. As you approach the entrance, either by shuttle bus or footpath, you find yourself surrounded by coasters and other intense rides on both sides of the entry way, with Vertical Velocity, a magnetically launched shuttle coaster stretching over the park’s actual entrance turnstiles. Once through the turnstiles, a different scene awaits, as the entrance plaza evokes a maritime village, complete with live dolphins. “We keep the big thrills at the front,” McCoy said, “and the back of the park is for our animals and family fun.” Surrounded by SUPERMAN Ultimate Flight, the world’s first triple launch Sky Rocket II coaster from Premier Rides and The Joker, a 3,200 foot long Rocky Mountain Construction re-imagining of an existing wooden coaster, Wonder Woman: Lasso of Truth becomes a new focal point for what has become an unofficial DC Comics themed area within the park. The ride itself is as intense, if not more so, than its coaster neighbors, and we were well advised by park staff to avoid eating until after our ride. About a quarter of the way up, Lasso of Truth quits being a gentle spinning/swinging ride and we and other riders we spoke to encountered the sense of skin being pushed against our faces, along with heavy bouts of both gravity and weightlessness. There’s also a unique sensation that one often doesn’t encounter on coasters – because of the spinning disc on which you sit, within seconds, you switch from being behind the pendulum arm to being in front, suddenly being hit by that wind as you’re pushed through the air at 70 mph. After an intense morning on the Northern side of the Bay, it was time to head an hour south to California’s Great America for the inaugural day of its new Red, White & Brews Festival. The event is tied to the new Patriot coaster, a Bolliger & Mabillard floorless coaster that had operated as a stand-up coaster for 25 years. The festival was set within an environment so captivating you could almost forget you were in a theme park. The overall feeling was that of an idealized county fair – something Norman Rockwell might have painted. Taking place in Hometown Square, one of the remaining themed areas from the first days of the park, Red, White & Brews pays tribute to the Americana on which the park was based when it opened in 1976. Giant Adirondack chairs, games of checkers and bean bag toss (very popular with the younger crowd), picnic tables, and wooden beach chairs in red, white, and blue filled the space. Under the square’s gazebo, dueling pianos played, while at a stage at the other end of the small park, guests could enjoy a rotating lineup of rock, country, and bluegrass bands. Beyond the entertainment, Red, White & Brews is a food and craft beer festival. Park guests can purchase sample cards and enjoy six different food offerings ranging from Asian pulled pork buns to a bacon-encrusted chicken heart skewer, along with six different beers or wines from a variety of options. Suffice to say, the event alone was well worth visiting the park and we stayed in Hometown Square for four hours before heading out to explore the rest of the park and enjoy the rides. Rides such as Wonder Woman: Lasso of Truth and Patriot, and events such as Red, White & Brews have become essential tools in retaining annual and seasonal passholders. As the number of passes sold in each park continues to increase, new ways are explored to entice passholders into making return visits throughout the season. Each time a passholder visits, he or she is likely to make purchases in the retail and food & beverage outlets throughout the park, providing additional revenue through these auxiliary sources. New attractions give current passholders an incentive to renew for the next season and others a reason to consider becoming new passholders. Parks announce their new features each year with plenty of fanfare. Often, the attraction’s announcement is made in conjunction with a substantially discounted advance sale on passes. A full calendar of unique events throughout the year provides additional return-visit incentive to passholders. As John Duffey, the President and CEO of Six Flags, has pointed out: “. . . we are successfully increasing attendance by investing in special events and up-selling guests to season passes and memberships.” It is not by chance that Red White & Brews was placed next to and in full view of California’s Great America’s annual pass processing center. Regional parks are also introducing interactive experiences as a way to entice return visitation from passholders. Cedar Fair has introduced augmented reality phone games designed by Holovis at both Cedar Point and Kings Dominion. At Knott’s Berry Farm, the company introduced VR Showdown in Ghost Town, in which players can compete against each other in a virtual world, while the company is also looking at new VR possibilities for California’s Great America (see InPark issue #68). Meanwhile, Six Flags offers a chain-wide interactive VR program on its coasters and drop towers (issue 68), including Kong at Discovery Kingdom. In the interactive virtual world, no two rides need ever be the same. As season pass programs grow even further, they will continue to reshape the face of the regional theme park, and keep the park operators on their toes ensuring the cycle of new attractions and events that helps spur the sale of passes, and bring the passholders back through the gates again and again.